The gods too are ever kind, Lenehan said. If I had poor luck with Bass's mare perhaps this draught of his may serve me more propensely. He was laying his hand upon a winejar; Malachi saw it and withheld his act, pointing to the stranger and to the scarlet label. Warily, Malachi whispered, preserve a druid silence. His soul is far away. It is as painful perhaps to be awakened from a vision as to be born. Any object, intensely regarded, may be a gate of access to the incorruptible aeon of the gods. I'm not sure how many times he called my name. I didn't even know he was standing beside me. The college library, wrapped around in rain and cloud, always sweeps me off on wet and murky days to misty, far-off lands of magic and myth. It was after half-three and there was only me in the library. My finger was still on the page. The story I had been reading – Theseus and the Minotaur – rang on and on like a gong in my mind. I turned around. Mr. Martin, my English teacher, was stood to my left in his blue roll-neck jumper. His black hair and beard, so Gina reckons (she's my best friend), makes him look like Captain Haddock in the Tintin books. He pulled up a chair. Rat-tat-tat went the rain on the windows. "Sister Mary Margaret," he began, "has asked if you could pop across to Manchester, Julie, and have a look at Rob Floyd's Stations of the Cross in the Cathedral. She’d like you to write a response for The Winged Lion." (That's our college magazine). I didn’t know what to make of what he was saying. I felt flustered and confused. "A response, Sir? Manchester, Sir?" Mr. Martin's voice was kind and patient. 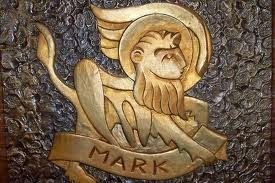 "Sister believes," he explained, "that St. Mark's should learn to stretch its wings, as it were, and engage a little more with events and things of interest outside Merseyside." I shook my head and stretched my fingers on the table's ancient wood. "I don't know, Sir. I'm not really into art, Sir. I like the piccies in storybooks, but that's about it." 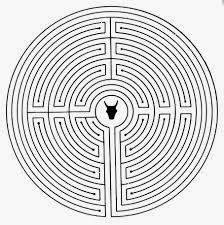 I pointed to the book and the drawing of Theseus following the golden thread around and around, this way and that, back and forth through the depths of the labyrinth. "It's words I'm interested in, Sir. You know that. It's sound of Sister to ask and I'm dead grateful, I really am, but someone like Anna Charpentier'd be miles better, if you want my opinion, Sir. She's mad about art. She's applying to the Courtauld for next year, you know." Mr. Martin fixed his sea-green eyes on me. He stood up and scraped back his chair on the black and white chequerboard floor. "Stop babbling, Julie. It's you she wants and that's that. She knows your capabilities. Society needs a shot of what you've got, she says – vision and creative fire. That’s what she wants from you – an individual, imaginative, dynamic response – a story, a myth, a fresh angle – not a sermon or a treatise on art." "Remember William Blake," he called out over his shoulder. "Remember that quote I gave you last week." Then he was gone. I puffed out my cheeks and glanced down again at Theseus tip-toeing his way through the labyrinth's curving corridors. It took me a while, once inside the Cathedral, to find my bearings. The walls seemed to shimmer and swim before my eyes, but the ancient, historic scent of the columns and stones settled me down and slowed the whirling in my head. It reminded me of the lush, panelled bookshelves that, for a hundred and twelve years, so Sister Mary Margaret says, have lined the long, dreamy corridors of the St. Mark's library. My surroundings sharpened into focus. I was standing on a shiny marble floor. Tall windows, to my left, glittered with red and yellow interlocking squares and circles. Candles flickered, to my right, on either side of a white wooden altar. The paintings – Rob Floyd's Stations of the Cross – surrounded me, pinned to thick dark pillars that curved and joined together at the top. The air was cool; the atmosphere calm and still. I weaved my way around, in and out of the pillars, and let the pictures tell their story. I was moved, more than anything, by the agony and distress imprinted throughout on Jesus's face – his frightened eyes, his bared teeth, his screaming mouth. When He meets His mother, it made me want to cry – the way she gazes up at Him with such a strong, strong love – a love that includes, but also goes beyond, sorrow and pain – a love that walks through walls. I liked, very much, the one where Jesus is nailed to the cross. The old man hammering the nail must be able to hear His screams, but he pays no attention and carries on banging it in. But not in a hateful, vicious, nasty way. His face isn't like that. It's gentle and kind and loving. There's a softness and tenderness to his expression that I found somehow beautiful. Some of the paintings scared me. Jesus looks frightened out of his mind in the one where he's fallen down and there's horses hooves and people's feet kicking around above Him. His eyes are gone. He's lost and helpless. A baby again. Then when he dies – in black and white – it's like the whole world's abandoned and forgotten Him, apart from that big cheesy moon in the top left corner. The pictures aren't all sad though. I love the colour and dazzle of the Women of Jerusalem and how they just stand there and look you right in the eye. 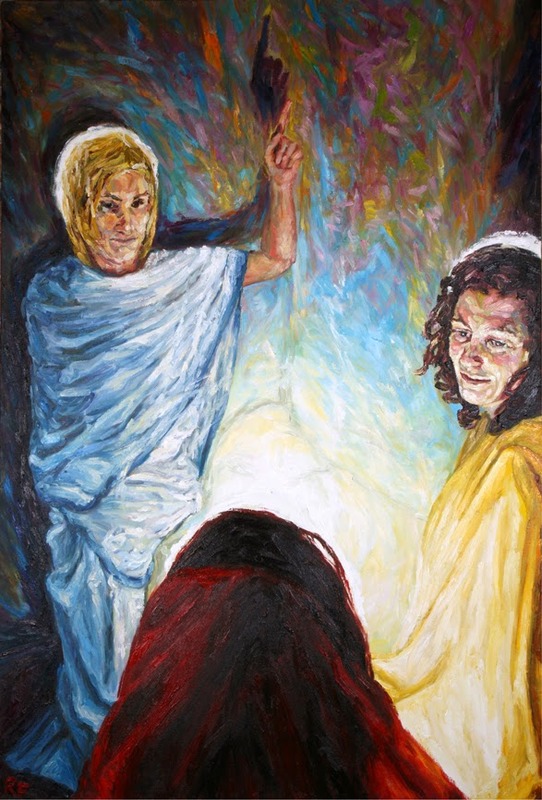 When Christ is stripped of His clothes as well, there's a bright white light that quivers around His head. One of the men sees it. The others don't. "Life in this world is no dream. But it could, and maybe should, become one." I sat on top of a rough-hewn slab, swinging my legs forward and back against the stone. I thought about my life and all the question marks and uncertainties hovering around it. Should I go away to Uni next year? Or stay at home? Or live with my sister in London? What about Ma? Could I ever leave her now that Dad's not here? How do I talk to her about her drinking? Then there's my own stuff. Should I carry on with my stories? Why do I write them? Who are they for? Myself? God? Dad? Society? Who am I? Why am I here? And now that I am here, what am I meant to do? 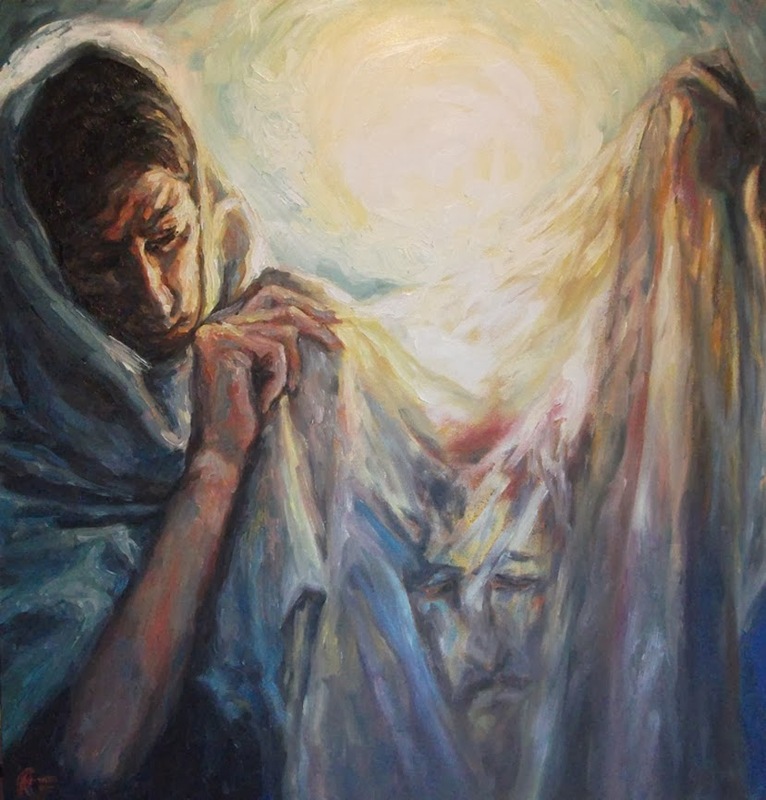 I focused my eyes on the light, the angels in the cave, Mary Magdalene (I think) listening to their message, and the pale fire trembling in the middle – a jet of quivering white and blue – flaring up from the centre of the earth. I scrunched up my eyes and concentrated as hard as I could, as if some code or secret that could answer all my questions might be hidden there, embedded in the lines and texture of the canvas. 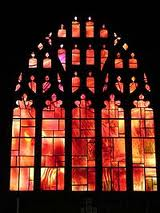 A window at the far end of the building – a stained-glass ball of fire – caught my eye – a swirling, billowing, raging bull of red and orange flame. It looked like the library book Dad had shown me just before he died – Liverpool at War – and the photos of burning, blazing warehouses at Herculaneum Dock. I spotted (so I thought) a faint lined pattern superimposed on the flames, a tissue of wafer-thin diamonds that merged together to form a picture. I honestly thought, crazy though it sounds, that a winged lion was slowly taking shape on the sizzling glass. I jumped down from the slab, crept forward and stood on tip-toe to get a better look. I turned around and swear I saw a figure there – above the slab – an angel with white spiky hair and a blue and purple robe. I bowed my head, looked up again and he (or she) was gone. ... Rob Floyd was an artist who lived and worked in Manchester before the Second World War. In 1939, he joined the army as a Captain in the Tank Corps. But when, one year later, the Battle of Britain was lost, Parliament surrendered straightaway, so Captain Floyd saw no action in the conflict. After the Treaty of Cambridge, the Germans occupied the whole of Southern England and the Midlands, leaving Wales, Scotland and the North in British hands, but run by a puppet government based in Manchester Town Hall. Disgusted, Rob Floyd left the city with his wife, parents and young child. He bought a Victorian mansion in Liverpool, called Saint Mark's, a former Catholic College that had closed in 1938 due to a lack of religious vocations. One day, Rob Floyd built a labyrinth with his son, Soren, from old bookshelves in the library. He placed one of his famous 1934 Stations of the Cross – 'The Angels' – in the centre. That same afternoon, a girl from Canning Street, Liverpool 8, arrived at St.Mark's, in search of hope, adventure and answers to her questions. Her name was Geraldine.